Image from AVN Photo Lab/Shutterstock.com. 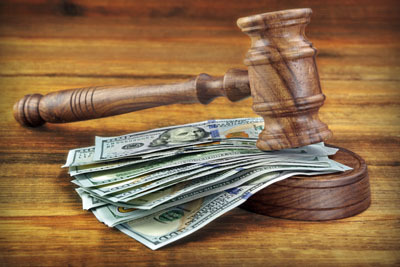 Updated: A federal appeals court has agreed to toss a challenge to New Mexico bail reform rules that discourage the use of money bail. The 10th U.S. Circuit Court of Appeals at Denver upheld dismissal of the suit as well as a sanction of nearly $15,000 against the lawyer for the plaintiffs. Courthouse News Service covered the Feb. 25 decision. Previously, judges had relied on a set schedule to set bail that was based on the severity of the charged offense. The New Mexico Supreme Court struck down that system in 2014. Voters ratified a constitutional amendment in November 2016 that said individuals who are not dangerous or a flight risk should not be detained before trial solely because they are financially unable to post bond. Implementing rules by the New Mexico Supreme Court said defendants eligible for pretrial release should be freed on personal recognizance or on an unsecured appearance bond—unless the court makes findings why those conditions won’t reasonably ensure the defendant’s appearance. The plaintiffs had challenged the rules and a risk assessment tool adopted by two courts to assess the likelihood that a defendant will fail to appear in court or will commit new crimes while on release. The risk assessment test is known as the Arnold Tool. The plaintiffs contended that the new rules and the Arnold Tool violated the excessive bail clause of the Eighth Amendment by taking secured bonds off the table as an option. They also alleged a due process violation on the ground that nonexcessive money bail is fundamental to the nation’s scheme of ordered liberty. The plaintiffs included the Bail Bond Association of New Mexico, five New Mexico state legislators and a woman who was denied cash bail before her arraignment. The lawsuit defendants included the New Mexico Supreme Court and the courts that adopted the Arnold Tool, as well as New Mexico Supreme Court justices and the chief judges of the courts using the Arnold Tool. The trial court dismissed the suit and granted sanctions because there was no reasonable basis to think the defendants’ immunity could be overcome and no reasonable basis to think the bail group and legislators had standing. The trial judge required plaintiffs lawyer A. Blair Dunn to pay a $14,868 sanction. The sanction was imposed under Rule 11 of the Federal Rules of Civil Procedure, which requires pleadings to be justified by existing law or by a nonfrivolous argument to extend, reverse or modify the law. The 10th Circuit affirmed in an opinion by Circuit Judge Mary Beck Briscoe. The plaintiffs’ standing arguments “ignored controlling precedent,” and their immunity arguments “suffer from similar infirmities,” the court said. Dunn told the ABA Journal that he is considering a request for a rehearing by the 10th Circuit panel or by the en banc court. If that fails, he expects to ask the U.S. Supreme Court to hear the case, although the cert petition could be limited to the Rule 11 issues. Rule 11 requires only that you have a plausible basis for your arguments, not that your arguments must be correct, he said. He and his co-counsel made good faith arguments on standing and would have made more extensive arguments on judicial immunity if they had received permission to lift page and word limits, he told the ABA Journal. There is some case law holding there is no judicial immunity in a case such as this because the courts were not performing a judicial function, he said. In Dunn’s view, judges are “openly upset” about being sued, and that sentiment seems to come through in the opinion. He also questions why he was sanctioned but his three co-counsel weren’t. “There’s really no discerning why I got singled out,” he said. He acknowledges doing media interviews after the suit was filed and also writing a letter to a legislative committee explaining why the suit was filed. But the court didn’t cite either of those differences in sanctioning only him, Dunn said. There are some “big holes” in the Rule 11 portion of the opinion, he said. Updated at 1:40 p.m. to include comment from Dunn. A regulation that bans bump stocks can take effect on March 26, a federal judge ruled Monday. U.S. District Judge Dabney Friedrich of Washington, D.C., refused to grant a preliminary injunction to block the regulation, report the Washington Post, Reuters and USA Today. Bump stocks, used to accelerate gunfire on semi-automatic weapons, were used in the deadly 2017 Las Vegas mass shooting that left 58 people dead. The new regulation defines a bump stock as a machine gun, a weapon that is banned under the Firearms Owners’ Protection Act of 1986. The regulation requires people who own bump stocks to destroy them or turn them in to federal agents. The new rule was issued by the Bureau of Alcohol, Tobacco, Firearms and Explosives. Friedrich ruled in consolidated lawsuits, Guedes v. ATF and Codrea v. Barr. One of the plaintiffs is the Firearms Policy Coalition, which announced in a press release that its attorneys have filed notice of appeal. A separate suit is pending in Michigan. The plaintiffs challenging the ban had claimed violations of the Administrative Procedure Act and the Fifth Amendment’s takings clause. Their suit also claimed that Acting Attorney General Matthew Whitaker had no authority to promulgate the rule because his appointment violated the appointments clause and an attorney general succession statute. Friedrich said most of the administrative law challenges are foreclosed by the Chevron doctrine that permits an agency to reasonably define undefined statutory terms. As for the takings clause challenge, the plaintiffs weren’t able to show that injunctive relief rather than future compensation is appropriate, Friedrich said. She also said the statutory scheme allows the president to select one of two statutes governing succession of Senate-confirmed officials. One is the Federal Vacancies Reform Act, which allowed for the appointment of Whitaker. She also rejected an argument that Whitaker’s appointment violated the appointments clause, which generally requires “principal officers” of the United States who report directly to the president be appointed with the advice and consent of the Senate. The Supreme Court has repeatedly embraced the government’s view that the temporary nature of acting duties allows individuals to perform them without becoming a principal officer, Friedrich said. A twin son born abroad to two married men—one a U.S. citizen and the other Israeli—is a U.S. citizen even though he was conceived with the sperm of the Israeli parent, a federal judge has ruled. U.S. District Judge John Walter of Los Angeles said the child, Ethan, was a U.S. citizen at his birth in September 2016, just like his twin brother, Aiden, who was conceived with the sperm of the U.S. parent. The Washington Post, the Associated Press and the New York Times covered the Feb. 21 decision. The boys’ parents had sought a “Consular Report of Birth Abroad” and a passport for the boys in January 2017 when they were living in Canada. The parents had used an anonymous egg donor and surrogate to conceive. The State Department granted the certificate and a passport to Aiden, conceived by the U.S. parent, and a tourist visa to Ethan, conceived by the Israeli parent. Ethan was denied the certificate and passport. Walter said a child born during a parents’ marriage does not have to demonstrate a biological relationship with both parents under the Immigration and Nationality Act. Because he ruled for Ethan and his parents, Walter said, there was no need to reach the plaintiffs’ argument that the State Department’s interpretation of the INA violated the due process clause of the Fifth Amendment. Immigration Equality and Sullivan & Cromwell had filed the suit on behalf of the family. Aaron Morris, executive director of Immigration Equality, was co-counsel. The State Department said in a statement Friday that it is reviewing the decision. The case is Dvash-Banks v. Pompeo. Jason Tashea. Photo by Saverio Truglia. “We’re entering an era in which our enemies can make it look like anyone is saying anything at any point in time, even if they would never say those things,” former President Barack Obama announced in a video PSA for BuzzFeed News last year. Calling attention to deepfakes, a technology that uses AI to manipulate images, Obama went on to reference Black Panther and said U.S. Secretary of Housing and Urban Development Ben Carson “is in the Sunken Place,” an allusion to the movie Get Out. After Obama insulted President Donald Trump, a viewer would be excused thinking that the ex-president was relaxed in retirement and watching a lot of Netflix. “Now, I would never say these things—at least not in a public address—but someone else would, someone like Jordan Peele,” he continued, noting the actor-director known for his Obama impersonation. The video, now in split screen, shows Obama and Peele, where it becomes apparent that Peele has been been the one talking all along, putting words in the Obama’s mouth thanks to deepfake technology. Levity aside, the warning from Obama-Peele is serious. Deepfakes, also called “AI synthesized fakes,” are rapidly evolving and proliferating. While many websites banned the use of the technology, new forensic tools are being developed to root out fakes. Meanwhile, lawmakers are pushing for new regulations while many lawyers argue that the law is already able to manage the illegal use of the emerging technology. At its core, a deepfake is what happens when neural networks, a type of AI, are merged with image, video or audio manipulation. Think of it as Photoshop on steroids. In its most common usage, the technology allows a person’s face to be superimposed onto an other’s. This has received the most attention in the form of adult videos featuring celebrities’ or average people’s faces transposed with the actors in the scene. And it’s not just used on faces. Emma Gonzalez, a survivor of the 2018 Parkland shooting in Florida, was featured in a video for Teen Vogue where she ripped up an image of a gun range target. Within short order, the bull’s-eye was replaced with a copy of the Constitution and quickly made its rounds on social media in an attempt to discredit the gun control advocate. Receiving less attention, the same technology can be used to create fingerprints to weaken biometric security features, according to recent research from New York University and Michigan State University. Collectively, this technology could continue to erode people’s trust in information. “I think the deepfakes issue goes to what is truth and what is fact in a post-truth and post-fact world,” says Damien Riehl, vice president at Stroz Friedberg in Minneapolis. 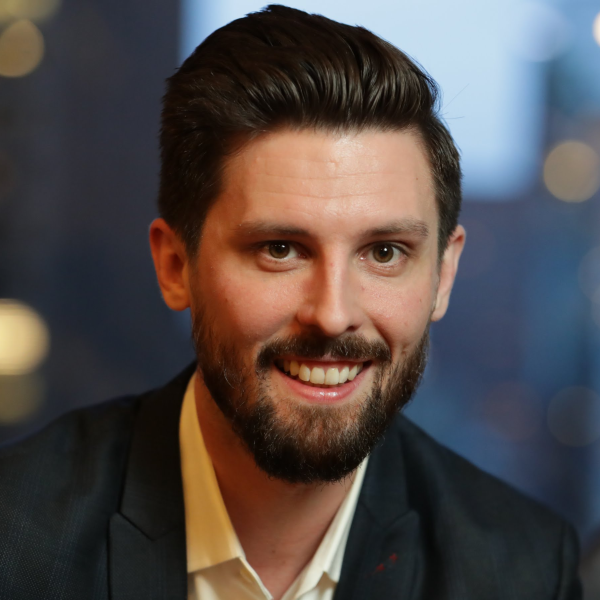 While the technology is novel and the specter of fake information is ever-present, this problem is not entirely new, explains Sam Gregory, program director at Witness, a nonprofit that teaches human rights advocates to use video. Using the term “shallow fake,” Gregory says he has seen people relabel the same video of a public lynching, for example, to be shared in locations as diverse as the Republic of Georgia, Myanmar and South Sudan, all with an intent to incite local violence. To root out fakes, his organization relies on traditional vetting, like comparing the video to location, sun and weather records, and modern approaches, like analyzing the file’s metadata, to verify a photo or video. As deepfake tools evolve, however, there is a concern that fakes will be more numerous and harder to spot. As part of a four-year project called the Media Forensics program, DARPA is developing these very tools to automate the assessment of media en masse. The end goal is to easily point out inconsistencies at the pixel level and incongruities with the laws of physics, and compare videos with external information. As emerging technologies continue to create gray areas and confound judges and lawyers, U.S. law may actually be ready for legal conflicts arising from deepfakes. “I think, generally, that certain uses of deepfakes are going to be actionable under existing law,” says David Greene, the civil liberties director at the Electronic Frontier Foundation. He added in a blog post on EFF’s website and in conversation with the Journal that misappropriation of someone’s likeness through a deepfake could be actionable under civil extortion and defamation law, similar to traditional photo-manipulation. Criminal fraud and harassment statutes are also potential tools. Even so, state and federal lawmakers want to create new sanctions. During the previous session of Congress, a bill was introduced in the Senate to criminalize the malicious creation and dissemination of deepfakes; however, the Senate did not act on it before the end of the session. According to Axios, Sen. Ben Sasse of Nebraska, the bill’s sponsor, plans to reintroduce the legislation. Meanwhile, in New York, a state lawmaker has put forward a bill to regulate a “digital replica” of a person through a new right to privacy, which has received push back from First Amendment and media advocates. At the practice level, Tara Vassefi, legal officer at TruePic, a digital forensics company, told the Journal that deepfakes will likely increase the cost of litigation because new forensic techniques and expert witnesses aren’t cheap. However, she believes that recent changes to the Federal Rules of Evidence (FRE) might inadvertently help lawyers manage this moment. In a blog post, Vassefi argued that amended FRE 902, which covers self-authenticating evidence, “speeds up the process and lowers the cost of using digital evidence”—including video. While she says amended FRE 902-13 and 902-14 were not intended for deepfakes, she reasons these rules, which apply to electronic information broadly, can control costs while keeping out manipulated photos from legal proceedings with the use of certified forensic technologies. “However, to date, lawyers are either unaware or not taking advantage of these amendments and only a handful of cases have drawn on the new rules,” she writes. While there is a need to further educate lawyers and policymakers as technologists continue to grapple with this technology, attorneys may see a familiar role for themselves in battling deepfakes, according to Riehl at Stroz Friedberg. Jason Tashea is the author of the Law Scribbler column and a legal affairs writer for the ABA Journal. Follow him on Twitter @LawScribbler. Correction: The spelling of Damien Riehl’s last name was corrected in two places on Feb. 26. 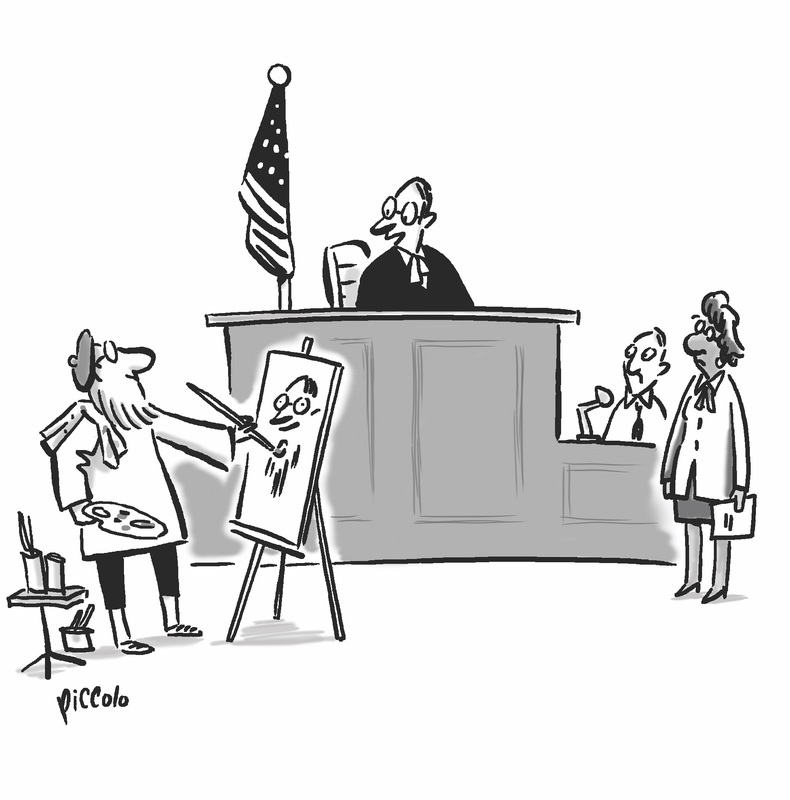 Is this an artful opening statement in the literal sense, or is the painter lawyer just trying to capture the judge’s good side? 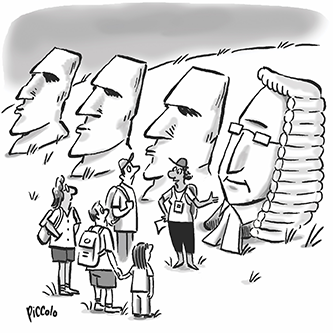 Send us your best caption for this cartoon. The winner of our March challenge will see their caption and credit printed in an upcoming issue of the ABA Journal. Congrats to January-February’s winning contest contributor, Charles Bender of Warrington, Pennsylvania. His caption below will appear in an upcoming issue of the ABA Journal. How the contest works: Readers are asked to consider what’s happening in the cartoon in this post and submit clever, original captions. ABA Journal staff will review entries, pick their favorites, then ask readers to vote on the best of the bunch. How to enter: Submit the caption you think best fits the scene depicted in the cartoon above by emailing captions[at]abajournal[dot]com with “March Caption Contest” in the subject line. Deadline for entry: Contest entries must be submitted by 11:59 p.m. CT on Sunday, March 17. The prize: Bragging rights. Plus, the winning caption and credit to the caption writer will appear in an upcoming issue of the ABA Journal. Check out this slideshow gallery of all of this year’s winners from our cartoon caption-writing contest. The U.S. Supreme Court has vacated a pay-equity ruling by a federal appeals court because the circuit judge who wrote the opinion was no longer alive when it was issued. The Supreme Court granted certiorari and ruled on Monday in a per curiam opinion. The court remanded to the 9th U.S. Circuit Court of Appeals at San Francisco without reaching the merits of the pay-equity dispute. Judge Stephen Reinhardt of the 9th Circuit had written the decision for the en banc court before his death last March. The decision was issued the following month. Five living justices joined Reinhardt’s opinion, while five others wrote or joined concurrences that were based on different reasoning. “The upshot is that Judge Reinhardt’s vote made a difference,” the Supreme Court said. Reinhardt’s opinion said salary history cannot be used to justify paying less to women in comparable jobs with men. The decision was based on a reading of the Equal Pay Act. The 9th Circuit had explained in a footnote that Reinhardt’s opinion and the concurrences were final before Reinhardt’s death. The Supreme Court questioned that statement. The Supreme Court referred to a 1960 Supreme Court ruling that found a circuit judge who had provided the critical vote in an en banc case wasn’t eligible to participate because he took senior status before the opinion was issued. At the time, senior judges weren’t allowed to participate in en banc cases. The holding applies to Reinhardt’s case “with equal if not greater force,” the Supreme Court said. Hat tip to the National Law Journal and SCOTUSblog, which had early coverage of the decision, Yovino v. Rizo. A Florida lawyer who invited his girlfriend to watch his opening statement in a DUI case instead delivered a marriage proposal in front of a jury of family and friends. She said yes. Fox News, the Daily Business Review, the South Florida Sun Sentinel and CBS 12 News have stories. Lawyer Brandon Dinetz had spent months planning the fake Feb. 7 trial in the Palm Beach County courthouse. He told his girlfriend, lawyer Jen Lettman, that he wanted her to watch the arguments. They had met in 2016 while working together at the state attorney’s office, but Lettman is now a lawyer at Link & Rockenbach. “When we worked together, we would regularly watch each other’s opening statements and critique each other, so it wasn’t unusual for me to be in the courtroom with him,” Lettman told Fox News. “I didn’t know the facts about the DUI trial he made up, and I didn’t really ask. Dinetz delivered an opening statement on love before getting on his knee to propose. Dinetz told the Daily Business Review that he wanted to make sure there were no ethical problems with the fake trial. He took the day off, he found a courtroom without any scheduled hearings, and no one there was on the clock at taxpayer expense. “It was the toughest secret I’ve ever kept,” Dinetz told CBS 12 News. A federal judge in Houston has ruled that the male-only draft violates equal protection principles of the Fifth Amendment’s due process clause. U.S. District Judge Gray Miller ruled Friday in a suit by the National Coalition for Men, report USA Today, the San Diego Union-Tribune, the New York Times and NPR. Miller granted the group’s motion for summary judgment but did not grant an injunction because the issue had not been briefed. The U.S. Military currently relies on volunteers. But the Military Selective Service Act still requires men between ages 18 and 26 to register for the draft. Men who fail to register can be fined up to $10,000 and imprisoned for up to five years. Miller noted that the U.S. Supreme Court had upheld the draft-registration law in 1981 in Rostker v. Goldberg. But women weren’t eligible for combat at the time, and the purpose of draft registration was to prepare for a draft of combat troops. Circumstances have changed since that ruling, Miller said. In 2013, the U.S. Department of Defense lifted the ban on women in combat, and in 2015, the department lifted all gender-based restrictions on military service. The government had argued that the decision to exclude women was justified by the administrative burdens of registering them. But the government did not present any evidence that Congress considered whether a female draft was unjustified because fewer women than men will be able to meet the physical standards of combat, Miller said. In a footnote, Miller said that combat roles “no longer uniformly require sheer size or muscle.” Women “could conceivably be better suited physically for some of today’s combat positions than the average man, depending on which skills the position required,” he said. The Selective Service System had argued that a ruling on the case should be postponed under separation of powers principles because Congress is currently considering whether to add women to the draft. The government had argued that the congressional debate also meant the case is not yet ripe for review. The government noted that a national commission was considering congressional recommendations. But there is no guarantee that Congress will act, Miller said. Congress has been debating the male-only draft since at least 1980 and recently rejected a proposal to include women, he wrote. And national security concerns don’t justify a refusal to act by the courts, he said. A condominium association is asking a Florida appeals court to kick the judge off its case because he affectionately clasped the hands of the opposing counsel after she approached the bench to speak about an unrelated matter. The De Soleil South Beach Residential Condominium Association has filed a petition for a writ of prohibition to remove Judge William Thomas from the case, the Daily Business Review reports. Previous coverage has identified the judge as openly gay. The opposing lawyer is Mary Barzee Flores, a former judge who served on the Miami-Dade circuit court at the same time as Thomas before she left the bench in 2011. She also worked in the federal public defender’s office with Thomas. The hand clasp occurred at the conclusion of a status conference Jan. 17, according to the condo association petition. After Barzee Flores approached the judge, she placed her hands on the bench in front of him. “While they were speaking, Judge Thomas took his two hands and clasped former Judge Barzee-Flores’ hands in a highly unusual and intimate sign of affection,” the petition says. Throughout the conversation, which lasted a few minutes, the hand clasping between Barzee Flores and Thomas led the condo president “to reasonably believe that their relationship was so close and tender that it appeared familial or one based on a lifelong or extremely personal relationship,” the petition says. Thomas denied a motion to disqualify himself on Feb. 4. A response to the motion says Barzee Flores had approached Thomas to tell him about her new position as deputy commissioner for consumer affairs for Florida’s agriculture commissioner. She is no longer on the case because of the new job.